I gotta say, I love this Half Full stamp set! I framed my photo using a piece of Year of Cheer Specialty Designer Series Paper. 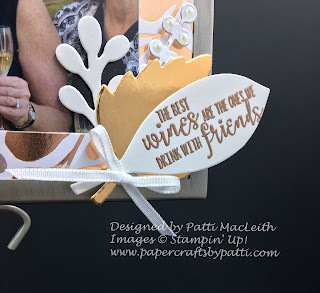 I used just the sentiment but to make it special, I embossed it in gold and then cut it out using the Leaflets Framelits. I added another leaf in Copper Foil and one Whisper White branch from Patterned Pumpkins Thinlits. The sentiment really sums up how I feel about these ladies in the photo with me! Have a great day, and thank you for stopping by! 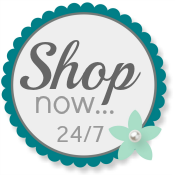 Use my Online Store any time! Oh my gosh...this sentiment is perfect for this picture! Adorable!! !